Stonehill Bluff is a giant camp located northeast of Volunruud and due west of the Tower of Mzark. This giant camp is inhabited by two giants, but no mammoths. The camp is located at the end of a ravine. The easiest approach to Stonehill Bluff is from the east. If you have Hearthfire installed and have built Heljarchen HallHF, travel is a short distance uphill to the west, then northwest to reach the beginning of the ravine. One of the giants is stationed on guard at the entrance. There are the normal markings of painted rocks, bone chimes and mammoth ribs and skulls. As you follow the ravine into and around the camp there are few patches of white cap and imp stool fungi. The camp itself is surrounded by large rock formations that form a basin. There are two large fires with a total of six charred skeevers cooking on fire-hardened spears over the fires. Around the camp there are a total of seven mammoth cheese bowl containers, and two chests with random loot; one is an unlocked wooden chest located at the northern end of the basin and the other is against the rocks to the east and is also unlocked. 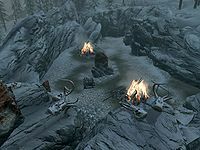 The fungi patches, charred skeevers, and mammoth cheese bowls do not seem to respawn with the rest of the camp. ? This page was last modified on 8 November 2014, at 00:29.